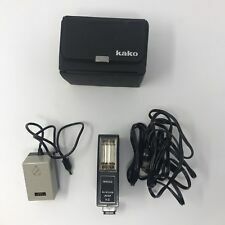 Vintage Kako 818 Electronic Camera Flash _ WORKS! Vintage kako 828 camera flash with mount. 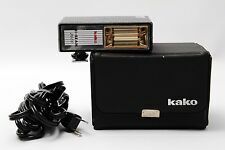 Vintage kako 828 camera flash with mount very good condition.please see pictures for more details. Vintage Kako Auto-Beam Flash, See It Work! What you see is what you get. All known condition issues noted above. This flash unit is in its' original box and has it's charging cable with it. See pictures for detail. Estate sale find. Not sure if it's ever been used. Writing on cover of manual. Good condition. You may want to clean them before using. I'm happy to resolve problems. BUY NOW, before they're gone! Use Kako 818-HS Electronic Flash unit with Box and Manual. Tested - Working. Manufacture: Kako. Other Notes: Has the box and manual. Here's a few notes about this model from the manual. Flash Duration 1 / 3000 sec. This item is in good used condition. Condition: Minor scratches and scuffs. Minor sticker residue on "dial". Kako electronic flash high beam 2400. Condition is Used. Shipped with USPS Priority Mail. Now that I am no longer a spring chicken I really don't need much so it needs. See pictures for condition details. Not every combination will result in a savings. You have to partially disassemble the flash to do it. I did not want to do it again just to take a picture, so I just took a picture of what is visible. This is in made in Japan and the serial number is 2151290. See pictures for details. Kako-88 Flash 35mm Film Camera Accessory Shoe Mount. Condition is Used. Shipped with USPS Priority Mail. Vintage Kako Auto-Beam Flash,Tested! !Working in original box w/ a/c cord CLEAN!! 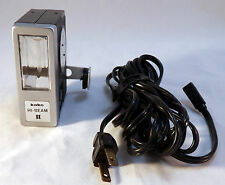 Up for sale is this like new vintage Kako Auto-Beam camera flash. This has been tested and is working perfectly. Seems like it was barely used. Comes with a/c cord as well. This is perfect for any vintage photography enthusiast or just someone looking for a nice vintage flash. Thank you for looking at my listing and please check out my other items for sale as well. This is a auto strobe DC unit for GN36 and GN22. ■ Kako Hi-Beam 2400 ■. IncludingGenuine Case, Electric Cable. B EXCELLENT Excellent condition with minor signs of use. OpticsBody is in excellent condition with minor signs of use. Condition93/100 B , EXCELLENT. This flash is untested but cosmetically in nice condition. The battery compartment is clean and rust free. If you need more pictures or have any questions feel free to ask. Thanks for looking and good luck! Don’t forget to check out my other items available for purchase! Panasonic PE-20S Electronic Flash Unit. Function: Seems to work fine. This is a Kako Kakonet P Universal Electronic flash. It has been checked and tested, and it is working perfectly. No battery corrosion. I will do my best to solve the problem with you. Notes(Important). (Batteries are not included). Manual (Japanese&English). Poor appearance. ■ Appearance. Appearance is beautiful. Excellent . tiny scuffs from normal use. There is no fungus. There is no fog. Kako Auto-201 Shoe Mount Universal Flash Unit. Function: Seems to work fine. AS-IS For Display Only. Works fro wall outlet and batteries. Never been used. Box and manual. ALL OF THEM AS-IS, UNTESTED, FOR DISPLAY PURPOSE ONLY, BECAUSE I AM SURE. YOU BUY WHAT YOU SEE FOR DISPLAY ONLY. 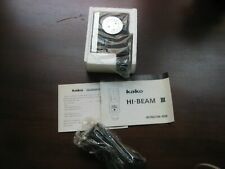 Kako Hi-Beam Flash Camera Accessories Set Auctions Deals Sales Bargains Buys. Condition is Used. All items Sell AS IS, please view photos thoroughly and read listing completely prior to bidding to ensure a complete understanding of what the quality of the item is and what is or is not included. Thank you for bidding and good luck! All items I sell are 100% authentic and come from a pet-free and smoke-free home. If you have any questions, please feel free to ask. Make sure you check out my other listings for more great deals!! Ships only within U.S.
Untested but appears to be in good cosmetic condition. Sold as is and shipped USPS. Feel free to message me with any questions and I’ll get right back to you.